The easy way to configure SNMP plugins in Munin is to use munin-node-configure. 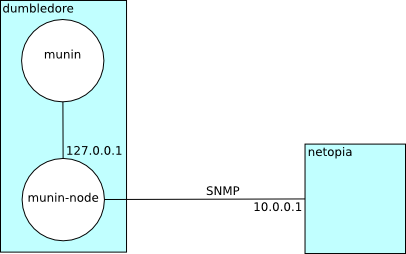 On the node you want to use as an SNMP gateway (“dumbledore”), run the configure script against your SNMP-enabled device (“netopia”). This process will check each plugin in your Munin plugin directory for the magic markers family=snmpauto and capabilities=snmpconf, and then run each of these plugins against the given host or CIDR network. Cut and paste the suggested ln commands and restart your node. Next time munin-cron runs, the virtual node should start showing up in your Munin website. You cannot easily set the SNMP community if it is different from the default public. # munin-node-configure --snmp your.host.domain.tld --snmpcommunity "seacrat community"
Note that the community strings are not automatically saved anywhere. You will have to store them yourself to a file under /etc/munin/plugin-conf.d/. This file should not be world readable. Always provide your community name unquoted. In fact, if you do quote it, it will treat the quote as part of the community name, and that will usually not work. Just note that any prefix or trailing white space is stripped out, so you cannot currently configure a community name with a prefix or trailing white space. To probe SNMP hosts over IPv6, use --snmpdomain udp6 with munin-node-configure. To have the SNMP plugins poll devices over IPv6, set the domain environment variable to udp6 in the plugin configuration file. Other transports are available; see the Net::SNMP perldoc for more options.